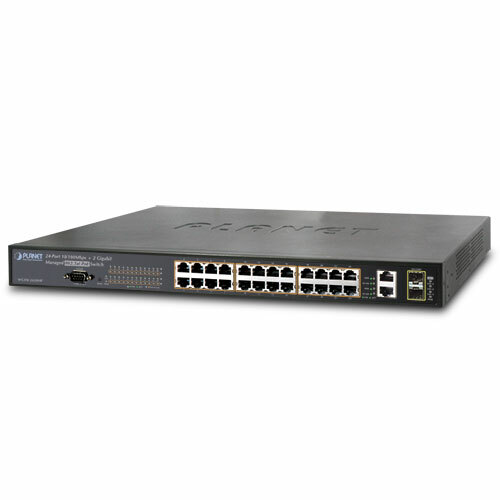 PLANET WGSW-2620HP, the next generation Managed PoE Switch, features IEEE 802.3af and High Power IEEE 802.3at Power over Ethernet (PoE) that combines up to 30-watt power output and data per port over one CAT 5E/6 Ethernet cable. It is designed specifically to satisfy the growing demand of higher power consuming network PDs (powered devices) such as PTZ (Pan, Tilt & Zoom) / Speed Dome network cameras, multi-channel (802.11a/b/g/n) wireless LAN access points and other network devices by providing double PoE power, more than the current conventional 802.3af PoE. The PoE in-line power following the IEEE 802.3af and IEEE 802.3at standards makes the WGSW-2620HP able to power on 24 IEEE 802.3af PoE devices or 12 IEEE 802.3at PoE devices at the distance up to 100 meters through the 4-pair Cat 5/5e UTP wire. The WGSW-2620HP provides advanced PoE management functions and high reliability. It features System PoE Admin mode for users to switch PoE system mode between IEEE 802.3af and IEEE 802.3at easily and flexibly. The Temperature Threshold and PoE Usage Threshold also enable more exact reliability control. The WGSW-2620HP offers 24 10/100Mbps Fast Ethernet ports with 2 Gigabit TP/SFP combo ports (Port-25, 26). The two Gigabit TP/SFP combo ports can be either 1000Base-T for 10/100/1000Mbps or 1000Base-SX/LX through SFP (Small Form-Factor Pluggable) interface. The WGSW-2620HP boasts a high performance switch architecture that is capable of providing non-blocking switch fabric and wire-speed throughput as high as 8.8Gbps. Its two built-in GbE uplink ports also offer incredible extensibility, flexibility and connectivity to the Core switch or Servers. To meet the growing network, the WGSW-2620HP provides advanced Web and SNMP management interface for efficient network operation. With its built-in Web-based management, the WGSW-2620HP offers an easy-to-use, platform-independent management and configuration facility. It also supports standard Simple Network Management Protocol (SNMP) and can be monitored via any standard-based management software. For efficient management, via Web interface, the WGSW-2620HP can be programmed for basic switch management functions such as port speed configuration, Port Trunking, VLAN, Port Mirroring, Rapid Spanning Tree and Misc Configuration. Additionally, the firmware includes advanced features such as IGMP snooping, QoS (Quality of Service), broadcast storm and bandwidth control, to enhance bandwidth utilization. The WGSW-2620HP offers comprehensive Access Control List (ACL) for enforcing security to the edge. Its protection mechanisms comprises Port-based 802.1X user and device authentication. Moreover, the Switch provides MAC filter and Static MAC to enforce security policies to the edge. The administrators can now construct highly secured corporate networks with considerably less time and effort than before. As the business expands, the additional telephones required could be installed at less cost via the implementation of PoE IP Telephony system than that of the traditional circuit wiring telephony system. PLANET WGSW-2620HP Managed PoE Switch helps enterprises to efficiently create an integrated data, voice, and powered VoIP network. PLANET IEEE 802.3af compliant IP Phones can be installed without any power cable because it can be powered via the standard Ethernet cable from the connected WGSW-2620HP. With the WGSW-2620HP, IP Telephony deployment becomes more reliable and cost effective, which helps enterprises save tremendous cost when upgrading from the traditional telephony system to IP Telephony communications infrastructure. Providing up to 24 PoE, in-line power interfaces and 2 Gigabit TP / SFP combo interfaces, the WGSW-2620HP can easily build a power centrally controlled IP phone system, IP camera system, or wireless AP group for the enterprises. For instance, IP cameras or wireless APs can be easily installed in the company for surveillance demands or building a wireless roaming environment in the office. Without the power-socket limitation, this Managed PoE Switch makes the deployment of IP cameras or wireless LAN AP easier and more efficient. The 2 Gigabit TP / SFP combo interfaces in the WGSW-2620HP also provide flexible Gigabit TP or fiber connection for uplink to public server groups.